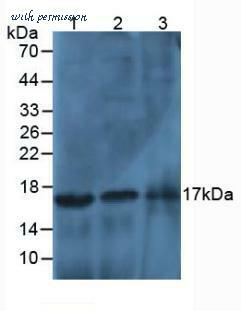 Western blot analysis of [pSer139] Histone H2AX, mAb (9F3) (Prod. No. ADI-KAM-CC255): Lane 1: MW marker; Lane 2: Jurkat cell lysate; Lane 3: Jurkat cell lysate treated with staurosporine; Lane 4: 3T3 cell lysate; Lane 5: CHO-K1 cell lysate; Lane 6: Rat-2 cell lysate. 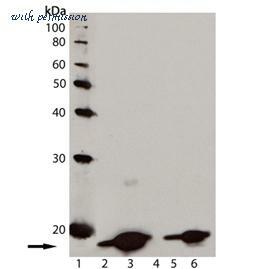 Western blot analysis of MW marker (1), Jurkat (2), and Jurkat + Staurosporine (3) using Histone H2AX (pSer139) pAb. Western Blot; Sample: Lane1: Human Liver Tissue; Lane2: Human Lung Tissue; Lane3: Human Cartilage Tissue. The HIST3H2A antibody from Proteintech is a rabbit polyclonal antibody to a recombinant protein of human HIST3H2A. This antibody recognizes human,mouse,rat antigen. 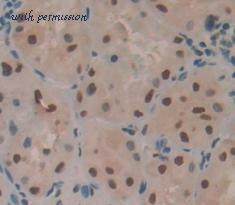 The HIST3H2A antibody has been validated for the following applications: ELISA, WB analysis.